Actor Henry Winkler Plays Not My Job For kids in the 1970s, The Fonz was the epitome of cool. Henry Winkler played the '50s greaser on Happy Days, who got all the girls and made vending machines spit out free sodas with his fist. We've invited "Fonzie" to answer three questions about Ponzi schemes. 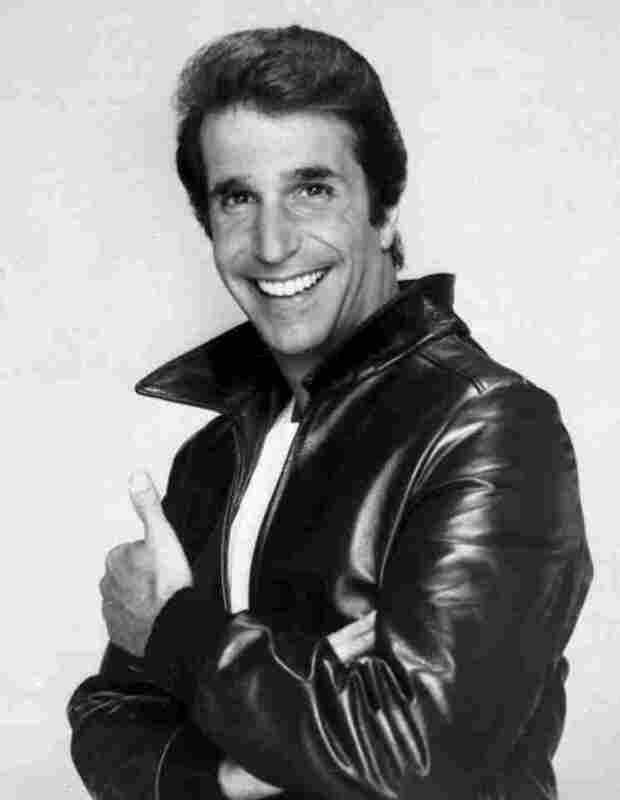 Henry Winkler as "The Fonz" in 1984. For kids growing up in the 1970s, there was one, absolute model of cool — not James Dean or Marlon Brando, but The Fonz. Henry Winkler played the 1950s greaser on the sitcom Happy Days who got all the girls, and even more amazingly, could make the vending machine spit out free sodas with his fist. Winkler joins us to play a game called "Ayyyyyy ... you took all my money!" 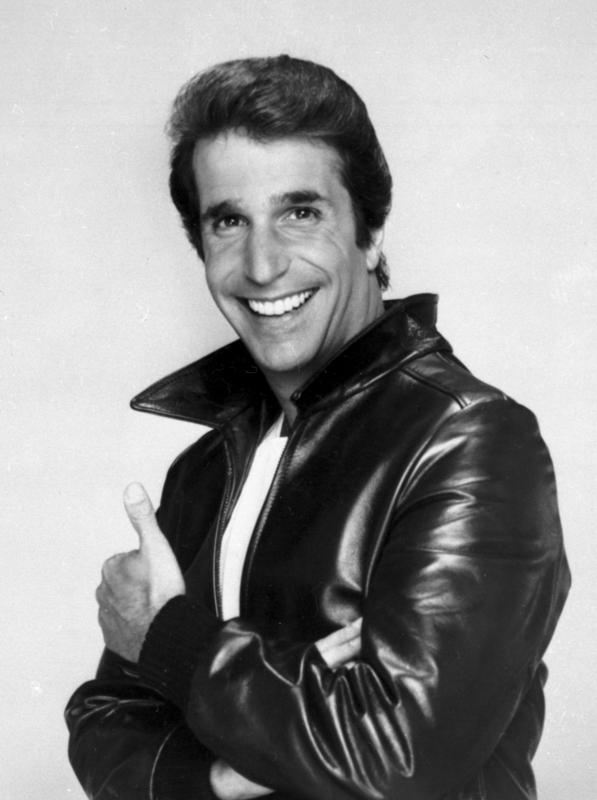 A Fonzie scheme would involve helping others through coolness and jumping sharks. A Ponzi scheme is something else altogether. Winkler answers three questions about Ponzi schemes. And now, the game where we ask somebody who's done a lot to do one more silly little thing. Now, when I was a kid some time ago, there was on absolute model of cool. It wasn't James Dean, it wasn't Brando, it was the Fonz, from the TV show, "Happy Days," played by Henry Winkler. He got all the girls. And even more amazingly, he could make the vending machines spit out free sodas with a blow from his fist. SAGAL: OK, I was 10. That was impressive to me. He's still cool. Henry Winkler, welcome to WAIT WAIT...DON'T TELL ME! How are you? HENRY WINKLER: I'm so happy to be here. SAGAL: It's so cool to talk to you. So, first of all, we were interested to see you have a new book out. It's about the least Fonziest thing we could imagine, fly fishing in Montana. WINKLER: That's right. It's called "I Never Met an Idiot on the River." SAGAL: Right. What's interesting is that you had your wife of many years do the introduction. WINKLER: That was a mistake. SAGAL: Yes, because she says, and I'll quote her, "Only in the serene beauty of fly fishing country does the crazed and competitive Henry Winkler appear." WINKLER: Well, the thing is that, you know, in a boat you have - I'm in the front and I have all the way to the guide and his oars. My wife is in the back. She has all the way to the guide and his oars. SAGAL: Right, from the other end, right. WINKLER: Her water looks fishier than mine. SAGAL: So you're like, turn this thing around? WINKLER: Well, no, I don't wait. I just start to fish her water. SAGAL: And you do all this, and you do not keep the fish? WINKLER: No, I always put the fish back. I won't even eat a trout in a restaurant. SAGAL: And for someone like me, who does not fly fish. SAGAL: This seems astoundingly pointless. SAGAL: You go to all this effort. WINKLER: Yeah. See, no, you know what it is? WINKLER: It's you, it's Zen. It's like a washing machine for your brain, because you cannot concentrate on anything else except you and that fish, or you lose the fish. SAGAL: Right. Do you think the fish wishes there was some other way you could find to relax? WINKLER: That is so funny. I don't have an answer. SAGAL: Now, your most famous role was Fonzie, the Fonz. Now, for people who were not lucky enough or old enough to have watched "Happy Days," can you describe that character? WINKLER: He was a mechanic. WINKLER: He was a leather-jacketed, motorcycle-riding loyal friend. WINKLER: He was so tough that he intimidated you by just the look. He never actually raised his hand to anybody. WINKLER: And I, as a very short Jew, that is the same experience. SAGAL: I mean, it's been years, but it was such an indelible role. I mean, action stars talk about sometimes how people come up and challenge them to fights, because they play tough men. WINKLER: You know what, all right, here's the great thing. WINKLER: Honestly, honestly, to this moment in time that we're talking, I have never been challenged. I have only been treated as a good friend. WINKLER: My wife and I have been stopped on the street of New York City by gangs who said: Oh, wait a minute are you Henry Winkler? Give this man some room. SAGAL: ...about jumping the shark. SAGAL: Now, I actually don't remember this setup. This refers to an episode of "Happy Days." Can you tell me what the setup was? WINKLER: We went to Hollywood. WINKLER: And I had to water ski, which I knew how to do. And my very short German parents would write me letters, and they would say: Tell the producers you know how to water ski. WINKLER: This is a great thing here. You could tell them that you could do this. I finally showed the producers the letter as a joke. SAGAL: Maybe he can make a success of himself if he can just water ski. WINKLER: If I water ski, I will have it made in the shade. WINKLER: Listen, I was invited to the White House. My father said: Go and take cake. SAGAL: All right, so you show the producers. This is back in the '70s. You show the producers the letter from your parents. Hey, I can water ski, you point out to them. SAGAL: So they come up with a story in which Fonzie has to water ski over sharks, over a tank of sharks? WINKLER: Yes, I did. Well, I jumped over a shark. About that time, a guy named Jon Hein, who now has a radio show. WINKLER: He was sitting in his dorm room with his good friend, and they came up with the expression, jump the shark. SAGAL: Right. Because they decided that "Happy Days" at that point started to be less good, shall we say, than it used to be, and they said the moment when "Happy Days" started to go downhill is when Arthur Fonzarelli jumped the shark. And so jumping the shark became this universal phrase for the moment when something starts to go bad. SAGAL: How does it feel then to be the person who enacted now the single most important cultural indicator of impending decline? WINKLER: I would like to say proud. WINKLER: But the fact is I've talked about his human being for 33 years, and I finally met him three months ago in New York City. WINKLER: We had a wonderful time. It was really lovely to meet him. SAGAL: I have to ask you a question. SAGAL: And we've only been talking for a little while, but I get the sense that you've never met anybody you weren't utterly delighted and happy to meet. WINKLER: You know what, my glass is half full, but there are three or four people I really dislike. SAGAL: Really? Can you name or describe any one of them? WINKLER: Unfortunately, I can't. One's a movie star. 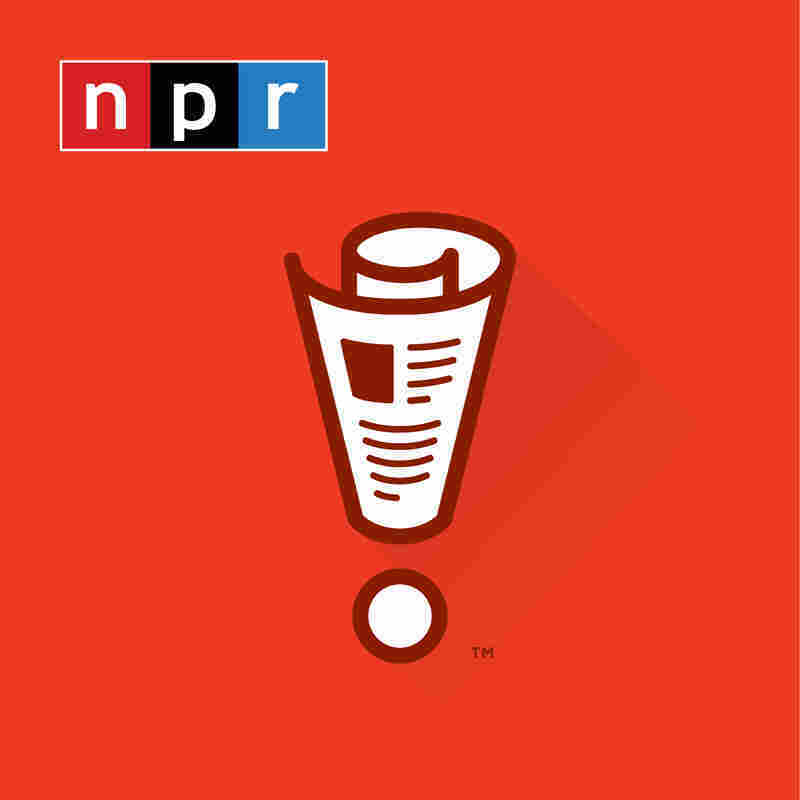 PAULA POUNDSTONE: You know, I met Henry, I think on the shuttle at Dulles. Wasn't that when we met, Henry? WINKLER: I think so, yeah. POUNDSTONE: And I'll tell you, I turned around and here was this guy standing behind me. And the thing that was - you know, how when you meet somebody and they're out of context and it takes your head a couple of kachinks to figure out where you know them from. And what struck me about him was, I was like well look at that happy little fella. WINKLER: You know, I'm doing the show from standing under my desk right now. Ayyyyyy, you took all my money. WINKLER: Wow, come on. Was that Kasell? SAGAL: Uncanny. Well, a Fonzie scheme would involve helping others through coolness and jumping sharks. A Ponzi scheme is something else entirely, as you may have heard about in the GOP debate this week. We're going to ask you three questions about Ponzi schemes. If you get two right, you'll win our prize for one of our listeners, Carl's voice on their home answering machine. Carl, who is Henry Winkler playing for? KASELL: Well, the Fonz is playing for Michelle Treestman of Arlington, Virginia. SAGAL: You ready to do this? WINKLER: I'm so ready, and I'm hoping. SAGAL: All right. We'll start with Charles Ponzi. SAGAL: The original Ponzi schemster. SAGAL: In 1920, he promised his investors a 50 percent return in just a few weeks, but some people were suspicious. So, to prove he was on the up and up, he agreed to do what? A, appear with a mind reader who could discern his true intentions? B, buy everyone in Boston, where he lived, a lobster? Or C, bring each investor to his mother's grave so that he could swear on it? WINKLER: Wow. OK, you know what I'm going to go with my instinct that got me here tonight. WINKLER: I'm going to go with A.
SAGAL: You're going to go with what? SAGAL: No, I mean, say that again. WINKLER: I'm going to go with Ayyyy. SAGAL: That's right, in fact. SAGAL: Ponzi agreed to appear with a mind reader at a Kiwanis club, but nothing came of it because audience members were far more interested in investing with him. He was in jail less than a week later. Next question. SAGAL: The Greater Ministries International Church of Florida ran a Ponzi scheme on its own congregants in the 1990s. Their get rich quick scheme was based on what? A, learning the trick of multiplying loaves and fishes from God? B, searching for lost Spanish treasure ships in Lake Okeechobee? Or C, investment grade collectible Happy Meal toys? WINKLER: Wow. I'm going to go with C.
SAGAL: You're going to go with C, investment grade collectible Happy Meal toys? I'm afraid it was A, or Ayyyy. The minister in charge of the scheme said God had modernized the loaves and fishes trick and taught him to apply it to the precious metals market. He made off with 500 million dollars. SAGAL: You have one more chance. If you get this one right, you win. And now lastly, we'll turn the greatest Ponzi schemer of all, Bernie Madoff. SAGAL: He is now being held at a prison camp in Butner, North Carolina. SAGAL: He's serving, I think, a 150-year sentence. WINKLER: Yes. Not long enough. SAGAL: Not long enough. Now, the prison camp is actually pretty tough, but it does provide what for the use of its inmates? A, an Indian sweat lodge? B, a climbing wall? Or C, a Bloomberg terminal for financial news? SAGAL: Yes. My advice here would be trust your instincts. SAGAL: If your instincts don't work, trust Fonzie's. SAGAL: Yes, A, an Indian sweat lodge. SAGAL: B, a climbing wall. Or C, a Bloomberg terminal for financial news. WINKLER: OK, now, oh my goodness. OK, I'm going to go with A.
SAGAL: I'm sorry, what did you say? SAGAL: It is Ayyyy, an Indian sweat lodge. Carl, how did Henry Winkler do? KASELL: Hey, the Fonz had two correct answers, Peter, so he wins for Michelle Treestman. Congratulations, Henry. SAGAL: Well done, sir. Well done. SAGAL: Henry Winkler's new book is called "I've Never Met an Idiot on the River: Reminiscences and Photos of Fly-Fishing." Henry Winkler, thank you so much for being with us. What a pleasure to talk to you. WINKLER: I really enjoyed being here.